If you have read my previous post, you would understand better this one. It’s about fulfilling a childhood dream of filmmaking, that finally concretized itself this summer when I was in Lebanon. Now this was not an easy journey, it was in fact a painful and laborious one, that required a lot of patience. But I can tell you that in the end, the reward just warms up your heart and makes you want to smile until your cheeks hurt. A year ago like now, in November 2010, I was contemplating an idea after having been deeply affected by a sad news in my family (a relative that held a huge place in my heart was fighting cancer). I wanted to express myself by writing this story and putting my feelings into words – and images. Moving images… A form of catharsis. Now I was doubting myself a lot, and re-wrote the script about three times before starting to feel a certain shape in the story. I was very much inspired by a couple that I look up to and for whom I have a huge admiration: Mounia Akl & Cyril Aris. This lovely duo has formed an amateur film crew called An Orange Dog Productions, and has been the catalyst of my whole motivation to pursue this project until the very end, since they are themselves professional filmmakers and actors. A few years ago, they shot a short movie called Beirut, I Love You (I Love You Not), which is a Beirut-ish tribute to Jean-Pierre Jeunet, Amelie Poulain, about (fleeting) love & the little pleasures in life. It was a huge success, went viral on YouTube and got over 100,000 views, not to mention the numerous Awards it won in film festivals across the globe. They did not stop there: their feverish eagerness and passion for the 7th Art led them to shoot another 20-min short film, entitled “Cheers, To Those Who Stay”, which also got acclaimed in festivals, and then a third one “Zero”. Meanwhile, they got contacted by a producer who got seduced by their movie “Beirut I Love You”, and asked them to direct a mini-web/TV -based series. Of course, they accepted, their energy and drive leading them to make amazing weekly mini-episodes that are enthusiastically awaited and watched by thousands of spectators worldwide. This was yet again another success story, and continues to be since they are about to release the first episodes of Season 2 in a few days from now as we speak. 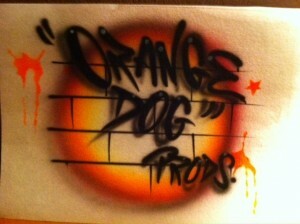 You can watch their channel on YouTube here: http://www.youtube.com/user/OrangeDogProds. These two awesome filmmakers and actors happen to be friends of mine, and I used to have conversations with them a long time ago about cinema and the directors that inspire us. And although those conversations were very few, they were one of the most precious moments in my life- those moments where you wish you could freeze time because you are so happy, like on a little cloud. They were always so passionate and enthusiastic about movies, that when they talked about them, their eyes would just sparkle and their smile would be so vivid and shining. We could talk for endless hours. There was something about them that I felt each time I talked to one of them individually, that same amazing vibe and connection that i could not find in anyone or anywhere else. Even though they were not going out with each other yet, they were still so amazingly similar with their charming smile, brilliant ideas and boiling creativity, and powerful drive to do something about this passion. So no wonder they became so close later on, given their unique complementarity and compatibility. So I contacted Mounia and Cyril to ask them to become potential actors in my short movie, and not only did they accept right away, but they were also of a huge help and support for me, otherwise I would not have been able to do this without them. They were sort of my “mentors” guiding me through every step of the preparation and the shooting, and I can’t be grateful enough. This post was about how amazingly lucky I am to have people like Mounia Akl & Cyril Aris in my life, and how they have helped me until the very end to concretize my project into reality. The next one will be about how I actually shot the movie, and the fabulous journey of being on set.